Is your company setting the wrong expectations for its customers? EP04: How can a couples’ massage POSSIBLY leave you cranky…? What do couples’ massages and unfulfilled expectations have in common? Probably not what you think! This week Jodi and Eliot talk about how a clear process can be just as important as a clear promise. Sometimes, no matter how good the product or service is, disappointment can still overshadow the experience when expectations aren’t met. Often, this is an issue of operations knowing what marketing is doing. And sometimes it isn’t a communications issue, it is a clarity issue. It can be even more of a challenge to get in front of expectations that you don’t even know to expect. What is clear is that there is something refreshing about setting authentic expectations – you don’t need to fluff up your promises like Ginsu knives for the promise to be compelling. If you know where people might be extra hopeful, or scared, or not know, then you can think about how you can address that before it happens. So often we are so focused on the problem that we have a solution for, that we don’t think about the thoughts and expectations that go through a client’s mind during the process. Sometimes, those fear are even more pronounced than the problem that brought them to you. Figuring out the process is one thing. The next level is to make sure it becomes part of the culture and operations of your company. 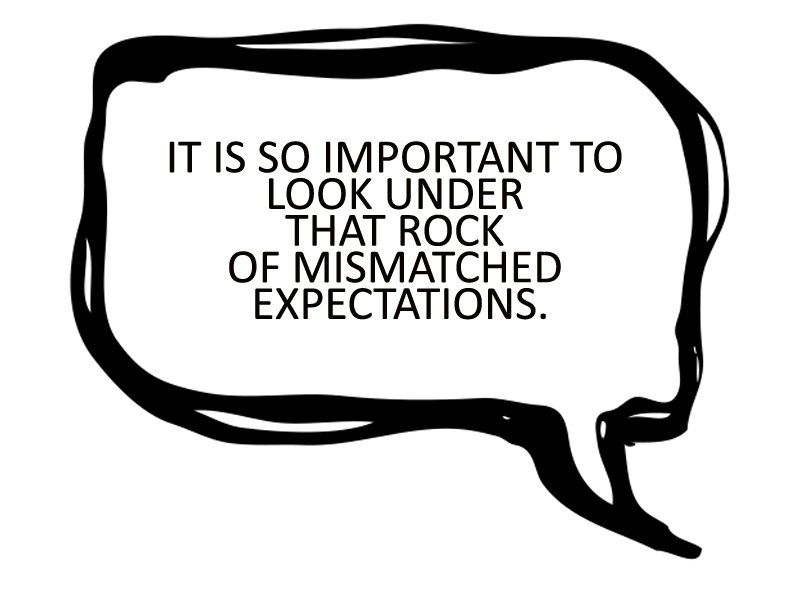 It is so important to look under that rock of mismatched expectations. Ep 03: When Leadership = Looking Dumb? Ep05: Christmas in July…?